Blending the classic with the contemporary, Souk Al Bahar, the “sailor’s market”, is a step back in time to the wonder and allure of old Arabia. Situated in Downtown Dubai’s beating heart, it is enchantingly Arabesque – a lively marketplace that offers the city’s residents and tourists alike an enthralling experience of shopping, entertainment and dining in intriguing contrast to The Dubai Mall, to which it connects via a bridge that spans the breadth of Burj Lake. 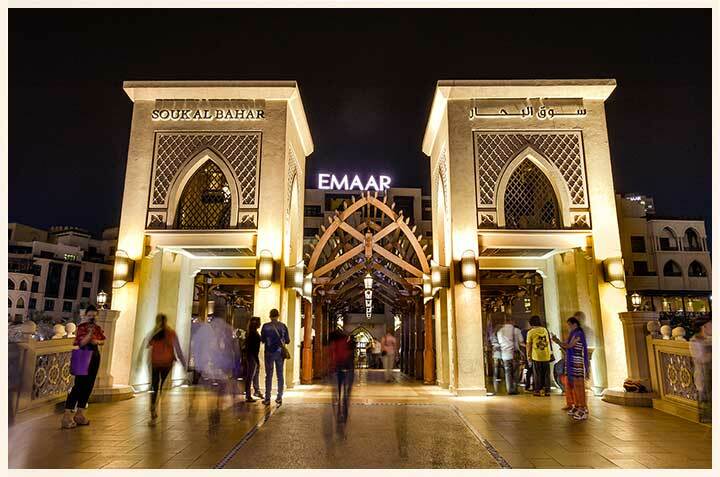 A mosaic of treasured heritage and enthusiastic expressions of retail, it features over 100 shops, amidst which lie 22 restaurants, cafés and lounges, most situated on the waterfront promenade, on the fringes of Burj Lake. A true vantage point to take in grand vistas of Burj Khalifa and The Dubai Fountain, it is quite likely one of the most photographed locations in the world. Natural stone corridors, tall archways, mood-enhancing lighting and Arabian-themed décor grace its shop-lined alleyways. It’s where you will discover rich tapestries and carpets, intricate handicrafts, eclectic jewellery, culturally-inspired fashion and heady perfumes, as well as furnishings, books, art and more. Seamlessly integrated into its charming fabric are conveniences such as ATMs, money exchange houses and grocery stores, ensuring the comforts of modern life are always close at hand. It is, quite possibly, one of the most beautiful interpretations of the Middle East’s rich and varied heritage, anywhere in the region. For your convenience, ATMs of major banks are conveniently located on level 2 and level 3. For further information, please get in touch with us on +971 4 362 7011/12. Dangerous activities such as sports and games including but not limited to rollerblading and skateboarding are prohibited.